ok at First i miss read the card and thought it is primordial glyph on steroids. But it can discover 1,2 and 3 cost spells. So on the list are: Tome of Intellect Icicle Book of Specters Snap Freeze Cinderstorm Arcane Missiles Mirror Image Arcane Explosion FrostboltArcane Intellect Frost Nova Shooting Star Astral Rift Research ProjectElemental Evocation and of course all secrets. We should add to list all lately announced spells Magic trick and ray of frost. Can we see rise of miracle mage? Gadgetzan Auctioneer is still a thing and combination with Sorcerer's Apprentice mage can mill decks quite fast. Lately announced mana cyclone can have great synergy as well. can burn mage use some of this combination to cycle for damage? 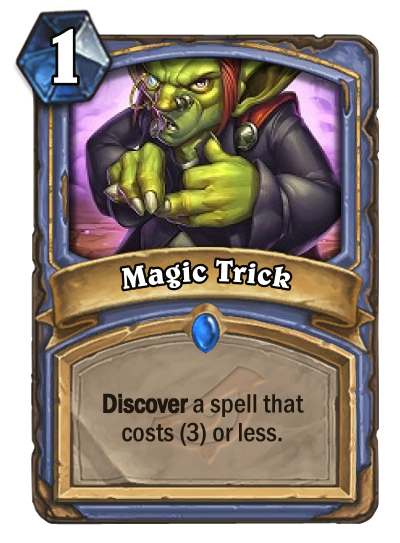 I like this card, I think there will be a miracle mage deck that will come about and if that deck ends up being good over the next few expansions then this card will 100% see play in it. This is an ok/good card in tempo small spell mage (feat. Mana Cyclone and Flamewaker), but a bad outcome from Kalecgos. If mage gets a reprint of Flamewaker, this will definitely see play in standard. Quest Mage in wild doesn't run the tome, so the things I said about this archtype were irrelevant. Mana Cyclone + Sorcerer Aprendice looks better and better. Will be the first deck I try when the expansion released. I still don't see why would Mage burn its deck. Maybe bc of something which hasn't been revealed yet? Sorcerer's Apprentice, Mana Cyclone, Ray of Frost, and this card. I don't know what it all leads up to but it sure looks like the cards are building up to something. Can we get a list of everything you can get? Arcane explosion, arcane intellect, arcane missiles, frost nova, frost bolt, mirror image, counterspell, Ice Barrier, Icicle, mirror entity, spellbender, tome of intellect, vaporize, book of specters, cinderstorm, snap freeze, astral rift, research project, shooting star, elemental evocation, splitting image, ray of frost and magic trick. Alot of Healing Cards are gone, Odd Warri is gone. DKs are gone. I can see aggro,burn Mage beeing a Top Deck. But Aluneth don't require any badish or okayish cheap spells in your deck. You could simply put your burst cards in and equip the weapon. If you play with Gadgetzan Auctioneer and these cheap spells, you deck will be so much weaker IMO. Moreover these cards don't let you to take most of the burst cards into your deck, bc of space.